"Biometrics is just starting to explode ... and you're seeing it now in the Registered Traveler program and other TSA programs," said EDS' Dee Gustowarow. EDS Corp. and Unisys Corp. are looking to the skies to expand their biometric security business. The two systems integrators are participating in 90-day pilot projects with the Transportation Security Administration's Registered Traveler program. The pilots will test technologies and systems that use biometric identifiers to screen passengers and move them quickly through security checkpoints at five U.S. airports. The first pilot began in June at Minneapolis-St. Paul International Airport, and the last pilot went live this month at Ronald Reagan Washington National Airport. TSA will use the results to decide whether to roll out the Registered Traveler program to other airports. The pilots will likely give Unisys and EDS a leg up on competitors if TSA expands the program to all U.S. airports, company officials said. The two companies also will be well-positioned for similar work on other transportation and military programs. "Biometrics is just starting to explode," said Dee Gustowarow, manager of the access control solutions division at EDS, which for 10 years has provided biometrics services. "It's just taking off, and you're seeing it now in the Registered Traveler program and other TSA programs." International Biometric Group LLC, a consulting and integration services firm, estimates that the annual market for biometric technologies will grow from $1.2 billion this year to more than $4.6 billion in 2008. Transportation industries such as the airlines will generate much of that revenue. For the Registered Traveler program, Unisys of Blue Bell, Pa., is running trials at Minneapolis, Los Angeles International Airport and George Bush/Houston Intercontinental Airport under a $2.5 million contract. EDS of Plano, Texas, is managing programs at Boston Logan International Airport and National Airport under a $1.2 million contract. The purpose of the Registered Traveler program is to improve the security screening process at airports. Select passengers, mostly frequent flyers, from different airlines were invited to become "registered travelers." TSA collects such personal information as their name, address, phone number, e-mail address, date and place of birth, eye color, height, citizenship and residences in the past five years as well as fingerprints and iris scans. The agency then checks the information against federal law-enforcement databases. Passengers who pass the background check are notified by e-mail. The scans take about five minutes per passenger, and the background checks take about a week to 10 days, said William Ritz, public relations manager of EDS Global Government Affairs. Each airport is using different technologies and security configurations. At Logan, passengers' biometric data are encoded on smart cards that they carry and insert into kiosks for verification before they board. At National Airport, a database system is being used to collect the information. Demand for biometric technologies has grown since the Sept. 11, 2001, terrorist attacks, after which the government started to channel funds to airports for passenger identification projects. [IMGCAP(2)]Biometric systems also are moving beyond fingerprint and iris scans to include facial recognition, hand geometry, middleware, voice and signature verifications and multimodal biometrics, or systems that use more than one physiological or behavioral characteristic for verification. Another key TSA biometrics program is the Transportation Worker Identification Credential program, called TWIC. Started in spring 2002, the project will establish a uniform identification system of smart cards encoded with holders' biometric data. The smart cards will give transportation workers access to areas at seaports, airports, railway terminals, pipelines and trucking and mass transit facilities. 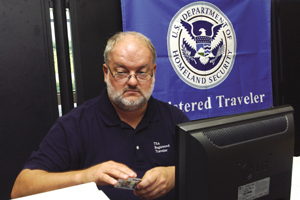 Last month, BearingPoint Inc. of McLean, Va., won a $12 million contract from TSA to begin a seven-month prototype phase, after which the agency will review the program's results and introduce TWIC cards nationwide. "You have a lot of people who are coming in contact with cargo either trucked or shipped into the United States, and a lot of areas are not as secure as TSA would like -- [areas where they] need to make some controls," said Larry Zmuda, partner of homeland security at Unisys, which has offered biometrics applications for 12 years. Building access is another area ripe for biometrics opportunities, according to EDS' Gustowarow. He said biometrics-based access-control systems would be used to verify the identities of soldiers entering military posts, freeing guards for other duties. He also said that the financial and health care industries are areas ripe for these biometrics systems. Industries in which employees must access secure Web sites also will drum up business because they use biometric peripherals, such as fingerprint scanners, attached to computers to identify users instead of relying on personal identification numbers, Gustowarow said. More demand for biometric technologies will come from overseas, said Gustowarow, whose company provides biometrics identification technologies in Israel at Ben Gurion Airport and at border crossings. Nations in the Asia Pacific region and Europe and the United Kingdom are considering using smart cards with biometric information for border control, immigration and passports, he said. "A lot of countries are under the gun because the United States decided that passports must have biometric" identifiers, Gustowarow said. Large systems integrators, such as EDS, Unisys, Lockheed Martin Corp., Raytheon Co., Northrop Grumman Corp. and IBM Corp. will benefit from the biometrics bonanza, industry insiders said. Zmuda said that everyone has biometrics. "It's not a question of who has the capability," he said. "The question is who has done it in a quick rollout."